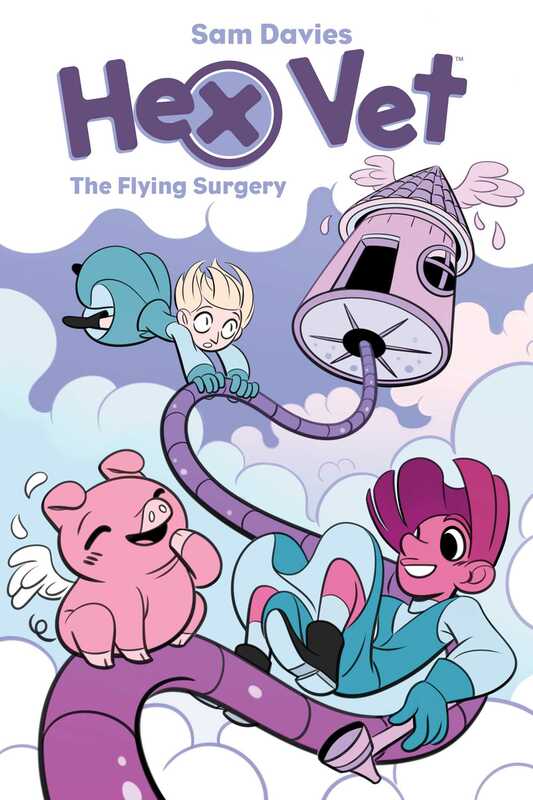 During the monthly Winged Creature Clinic at Willows Whisper, Nan and Clarion investigate disturbing reports when they’re brought an injured flying pig that appears to have been mistreated. It’s time for the monthly “Winged Creature Clinic” at Willows Whisper Veterinary Practice, where flying creatures from all over come to get treated. But when Glenn the Wildlife Warlock brings in an injured flying pig that looks like it may have been mistreated, panic strikes and a greater mystery unfolds. It’s up to everyone’s favorite vet witches in training, Nan and Clarion, to keep everything under control at the chaotic clinic while Dr. Talon is away. Will Nan and Clarion save the day and keep their jobs? Or are their days at Willows Whisper numbered? Don't miss out on the action in the second Hex Vet original graphic novel from acclaimed cartoonist Sam Davies (Stutterhug)!